FILE PHOTO: Iranian Military Chief of Staff General Mohammad Baqeri meets with Turkish Chief of Staff General Hulusi Akar (not seen) in Tehran, Iran October 2, 2017. BEIRUT - Iran’s military chief of staff visited a frontline position near the Syrian city of Aleppo, a military news outlet run by the Lebanese group Hezbollah reported on Friday, during a visit that has underlined Tehran’s deep military role in Syria. 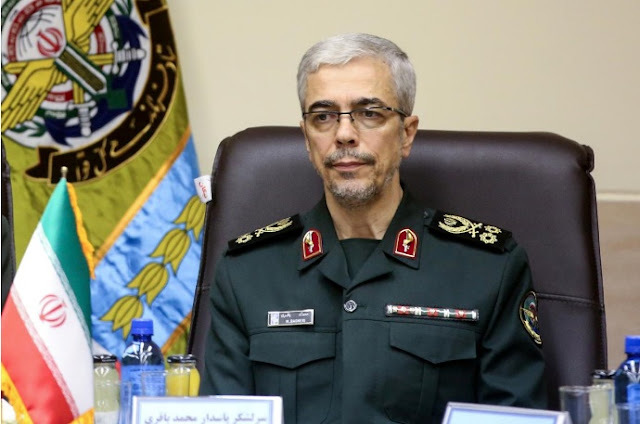 General Mohammad Baqeri visited the position with a number of Iranian officers, according to the report, which was accompanied by photos showing Baqeri looking at a map and peering through binoculars. Neighboring Israel has expressed deep concern over Iran’s role in Syria, where Iranian fighters and Iran-backed groups such as Hezbollah have played a major role fighting in support of President Bashar al-Assad. Baqeri met Assad on Thursday during a visit to set out a joint military strategy, Syrian state media reported. Baqeri has warned Israel against breaching Syrian airspace and territory and pledged to increase cooperation with Syria’s military to fight both Israel and Sunni jihadist militants. Israeli Prime Minister Benjamin Netanyahu has said that Iran is strengthening its foothold in Syria, warning that Israel would “do whatever it takes” to protect its security. Helped by Russian air power, Iran-backed groups including Hezbollah played a major part in the Syrian government campaign to recapture eastern districts of Aleppo city from Syrian rebels last year. Rural areas to the south and west of the city are still in insurgent hands. Iran’s military chief of staff visited a frontline position near the Syrian city of Aleppo, a military news outlet run by the Lebanese group Hezbollah reported on Friday, during a visit that has underlined Tehran’s deep military role in Syria.